Jon went above and beyond my request and prepared a list of over ten top-notch places for me to try. Although I wanted to hit them all, time constraints kept me from rocking the Bay Area party to the fullest. One of the items that stuck out from the lengthy list was Magnolia Pub and Brewery. “Go for their beers and fried chicken on Thursdays,” recommended Jon. For some inexplicable reason, I find foods that are consumed on a designated day of the week infinitely more appealing than those that are always available. Granted, fried chicken tastes great just about every day, but the fact that it’s served only on Thursdays at Magnolia somehow makes it all the more special. I heart gimmicks. The Astronomer and I, along with our good friends and former teammates Matt and Paul, headed to Magnolia for an early dinner. When we arrived at the bar, I was surprised by the large number of babies on the premise—I guess new parents need their fried chicken fix too. I was also taken aback by the general lack of dinginess. Gastropubs in San Francisco are so clean and family-friendly! Even though I arrived with fried chicken on the brain, I couldn’t resist the roasted beet salad starter ($9). 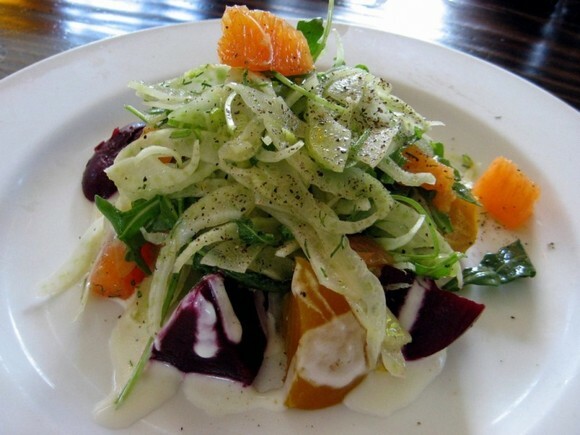 The red and golden beats were paired with arugula, goat cheese, cara cara oranges, fennel, ground pepper, and a creamy dressing. All the ingredients were extremely fresh and at their most delicious (and nutritious) peak. Well-composed salads are kind of like art. My three dining companions and I shared two orders of the fried chicken special ($18 per order). Each portion consisted of half a chicken and two sides. 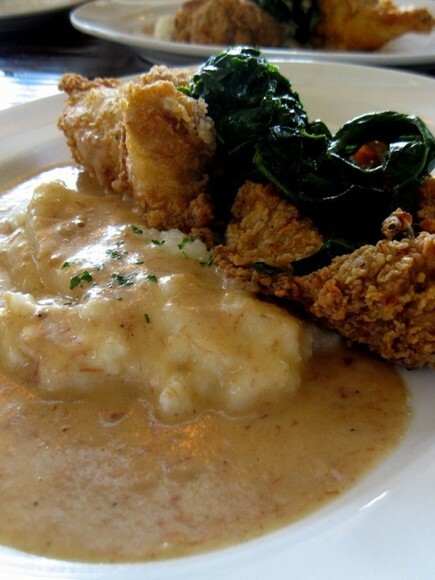 Our plates of hormone-free fried chicken arrived meticulously deboned atop toothsome grits smothered in savory gravy. The platter was finished off with a neat pile of buttery sauteed spinach. Without bones to gnaw on, our fried chicken dinner was strictly a knife and fork affair. The well-seasoned and thickly battered chicken was fried to a delicious crisp, leaving the meat tender and juicy. The grits, gravy, and spinach, which were all great on their own, complemented the chicken very well. The Astronomer was so enamored with the gravy that he drenched his chicken in it before every bite. My friends and I weren’t expecting such a gourmet fried chicken experience at a bar, but were pleased as heck with our dinner. There’s no question that Magnolia fries up a killer bird. I was just at the Magnolia Pub and Brewery this weekend! They have some darn good eats and some fabulous beers. Their Kalifornia Kolsch is awesome. I’d love to know more about this mysterious list of gastropubs! 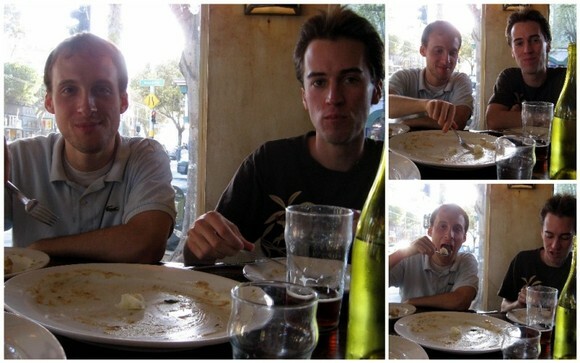 I’m in the midst of planning a CA trip for this June, and need a place to eat in SF while I’m there. We will have two eating opportunities in the city (not enough, I know) and one of them is going to be Ton Kiang; I can’t resist the idea of great dim sum. Would love to go to a gastropub while we’re there too! oh I’ve been hearing about the chicken for a while and this is on my long list… that chicken plate piled with goo looks amazing. 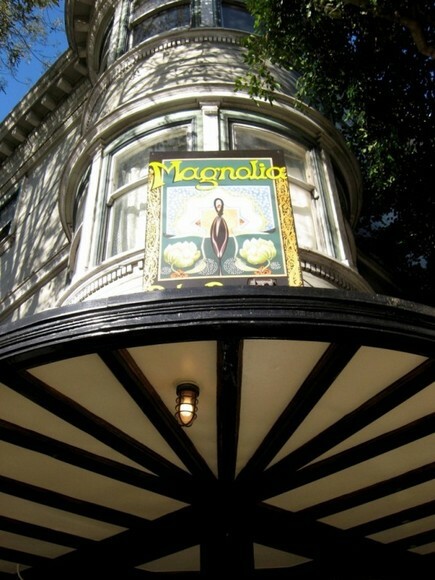 Rachel – Magnolia definitely fits the gastropub bill. It’s also located in a distinctly S.F. neighborhood, which is a plus. foodhoe – The Fried Chicken Sluts need to hit up Magnolia on Thursdays. No ifs, ands, or buts.